Statistical Model: We propose an integrative Bayesian analysis of genomics data (iBAG) framework for identifying important genes/biomarkers that are associated with clinical outcome. 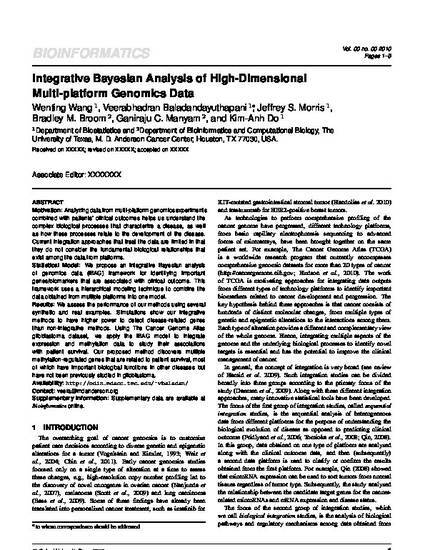 This framework uses a hierarchical modeling technique to combine the data obtained from multiple platforms into one model. Results: We assess the performance of our methods using several synthetic and real examples. Simulations show our integrative methods to have higher power to detect disease-related genes than non-integrative methods. Using The Cancer Genome Atlas glioblastoma dataset, we apply the iBAG model to integrate expression and methylation data to study their associations with patient survival. Our proposed method discovers multiple methylation-regulated genes that are related to patient survival, most of which have important biological functions in other diseases but have not been previously studied in glioblastoma.